It has been a busy few weeks at Intrinsic Quality. 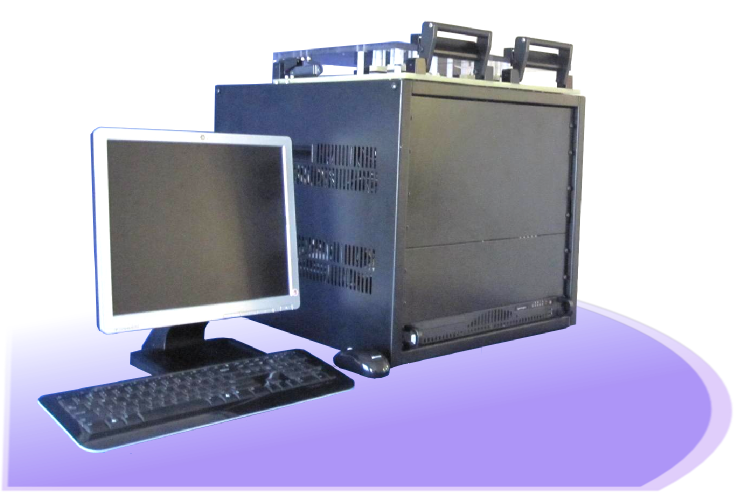 We recently completed the build and debug of a complex, custom, precision functional tester for flexible printed circuit board testing. 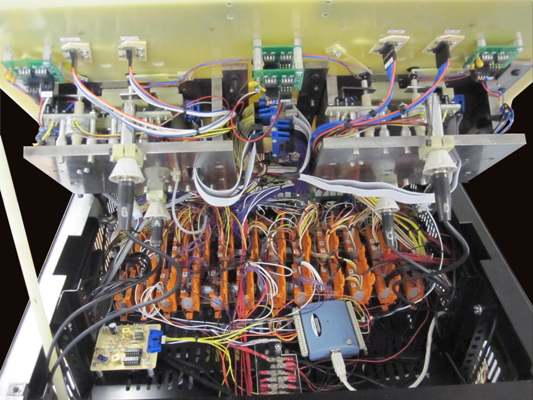 The tester was commissioned by an American medical manufacturer and the flex board being tested will eventually end up in an endoscope assembly. The flex board seemed fairly simple. It had a female SIP header, a set of a dozen flexible brass battery contacts, a dual stage push button and a small speaker/buzzer. To achieve the necessary throughput, the tester was to test four boards in parallel in a dual well configuration. The specification required several different types of tests for the device. First, continuity was tested between the contacts and header. Then the height of each contact was measured within a thousandth of inch. Next, the force and the resistance at the two switch points of the push button were measured. Finally, the tester would measure the speaker’s sound pressure level at several frequencies. The customer requested data logging and a printer to print detailed fail tickets. To measure the contact heights, the flex boards were precisely registered and clamped onto a precision ground plate. Intrinsic Quality used a stepper motor to raise a platform of fixed test pins which had been ground coplanar and parallel. These pins were raised in steps until they would make electrical contact with the flex’s contacts. Both make contact and break contact tests are performed, with the test results displayed in the custom created GUI (graphic user interface). 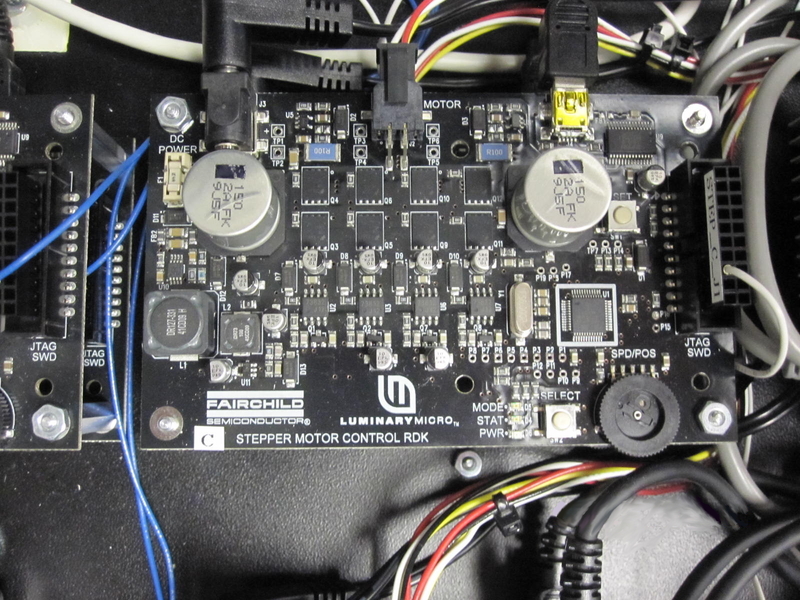 The two stage push button on the device was tested with a separate set of stepper motors and a precision force transducer. 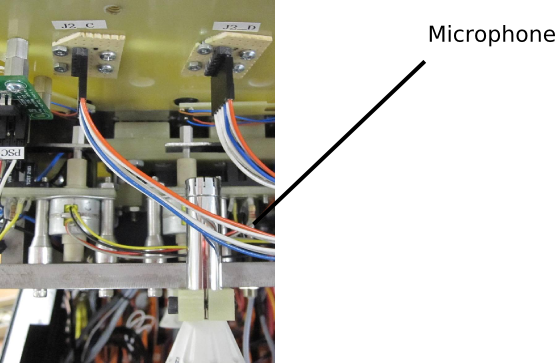 Because the switch actuation was dynamic, the switch force was collected into an array as the stepper gradually moved to close the switch. In the charts below, a graph of the actual results are compared to the manufacturer’s specifications. 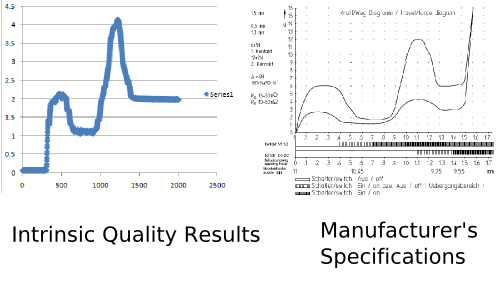 Once the data was collected software analysis identified the local peaks. To test the speaker, microphones were mounted below the flex boards and connected by means of a switching matrix to a sound pressure meter that interfaced with the PC. A voltage controlled oscillator was used to set frequency and voltage levels using a pair of digital-to-analog-converters. The oscillator was sequentially switched to each of the speaker inputs on the flex boards. You are currently browsing the Intrinsic Quality LLC blog archives for September, 2012.